Every year, there’s a new iPhone. And every year, people ask themselves the same questions: “Should I upgrade? Can I afford it?" In the past, that decision has depended mostly on the kind of deal you could get from your chosen wireless carrier. But this year, the landscape has shifted: There are more options than ever when it comes to buyingthe new iPhone 6s and 6s Plus. You can pay for the phone up front or in installments. You can buy from a carrier or from Apple. And you can get a warranty from Apple, your carrier, or a third-party service. So, which of those options is best for you? There’s no single answer that’s right for everyone. Rather, you have to figure out what makes the most sense for your particular situation. As someone who’s in the market for a new phone (specifically, the 64 GB iPhone 6s), here’s how I’ve been sorting through those decisions. There are a couple of advantages to buying the phone outright: For one, you’ll get an unlocked phone. An unlocked phone makes it easier to switch carriers if you ever decide to do so. And it’s also handy if you do a lot of traveling abroad: You can often swap in a new SIM card from a local carrier, rather than relying on your U.S. carrier’s international plan. The other advantage to paying up front: You’ll actually own the phone, so when next year’s new iPhone rolls around, you’ll be free to either sell your current phone (perhaps through a third-party service like Gazelle) or to pass it on to a friend or family member. You can buy unlocked phones outright from either Apple or your carrier; the prices for those two sources rarely differ significantly. The downside to buying your iPhone outright is that it requires a lot of money. 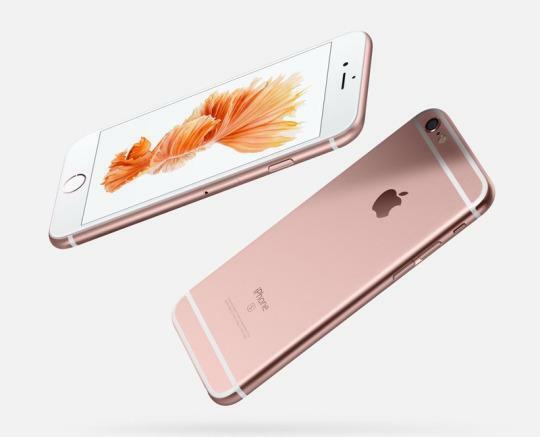 For example, the 64GB iPhone 6s I want costs $749. If you don’t have a big chunk of disposable income, then it may not be the best approach. The alternative is to pay in installments. Almost all carriers now let you pay for your phone on a month-by-month basis: The cost of the phone is divided up over a term — two years, say — and then simply added to your bill. Eventually, you’ll have paid the full value of the phone, and at that point, you’ll own it. These installment plans aren’t the same as the contracts carriers used to offer, under which you’d commit to the carrier for a two-year term and, in exchange, the carrier would sell you the phone for a lower, subsidized price. Carriers are moving away from that contract model these days. But installment plans do still require long-term commitments. The exact terms of installment plans not only vary from carrier to carrier, but also are changing rapidly as wireless companies jockey for your attention. Sprint: I could pay as little as $19.77 a month for 22 months — if I were willing to trade in my existing phone and I wanted to be able to upgrade to the next iPhone whenever I wanted to. Alternatively, I could pay Sprint $31.25 for 24 months if I wanted to own the phone at the end of the period. T-Mobile: I could opt to pay $27.08 per month for 24 months for the phone, but I’d also need to fork over a $99 down payment. Or I could pay $10 more per month for the company’s Jump! plan, which would let me upgrade whenever I want. Verizon: Its only option is a hefty $31.24 per month for 24 months, with no option to upgrade. Keep in mind that all of those monthly installment plans cover only your phone — you’ll still need to pay for wireless service, either through your existing plan or a new plan. 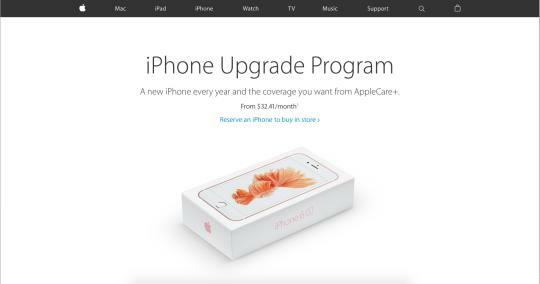 To make things more complicated, starting this year, Apple is also offering an installment plan of its own: the iPhone Upgrade Program. One advantage of the program is that Apple acts as the middleman, so it doesn’t matter which carrier you have. For another, as when you pay up front, you’ll get an unlocked phone instead of one tied to your carrier. The 64GB iPhone 6s I want would run me $36.58 per month from Apple — but, as with AT&T, that would give me the option of updating to a brand-new iPhone when next year’s model comes around; just 12 months of payments would make me eligible for an upgrade. It also includes an extended warranty service in the form of AppleCare+ (see below). Obviously, a big factor in this decision is the carrier you’re currently signed to and the contract you currently have. Depending on those circumstances, you may need to pay off your existing phone before you can upgrade to an iPhone 6s or 6s Plus. Meanwhile, if you opted to buy an unlocked phone outright, you’d still need to pay someone for your wireless service. Sprint rules the roost here, with an unlimited plan costing $60 per month. AT&T and T-Mobile offer 5 GB monthly plans for $75 and $70, respectively, and Verizon has a 6 GB plan for $80. Of the major carriers, only AT&T seems to offer any discount for bringing your own phone: That $75 rate is $25 cheaper than its contract rate and $10 less than what you’d pay if you signed up for its AT&T Next upgrade service. 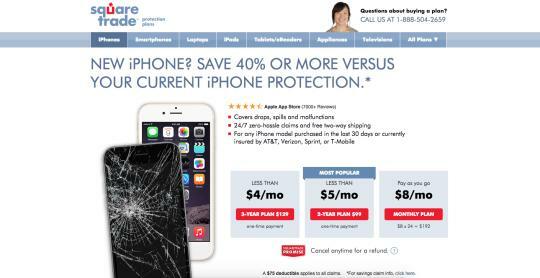 If you’re worried about breaking your phone, Apple and most of the carriers offer their own extended warranty services. AppleCare+ normally costs $129 but is included as part of the iPhone Upgrade Program. If your phone breaks as the result of an accident, you can pay $99 to have it repaired or replaced, up to two times during the coverage period. The carriers also offer a variety of insurance plans, usually for a monthly fee of between $7 and $11. The exception is T-Mobile: Its Jump! upgrade plan includes insurance as part of its monthly fee. All of those plans come with deductibles (which, for a brand-new iPhone, often approaches $200), and they limit claims to twice per year. You can also opt for a third-party insurance program, such as SquareTrade, which will cover accidental damage or malfunctions for a monthly fee of $8 (or less, if you pay for it all up front). In pretty much all of those cases, you’re covered if, say, you drop your new 64GB iPhone 6s to the sidewalk two days after you walk out of the store. With Apple’s service plan, you’d hand over $99 and either have your phone repaired or replaced (depending on the extent of the damage). Most of the carriers would probably charge you their highest deductible (since it’s a brand-new phone), which would be around $200 (T-Mobile maxes out at $175). They’d then replace your phone within 24 hours. SquareTrade, on the other hand, would charge only a $75 deductible and would overnight you a new phone or reimburse you if you choose to have it repaired yourself. Obviously, sorting through all of these options isn’t simple, but it must be done. Everybody’s upgrade path is going to be a bit different. 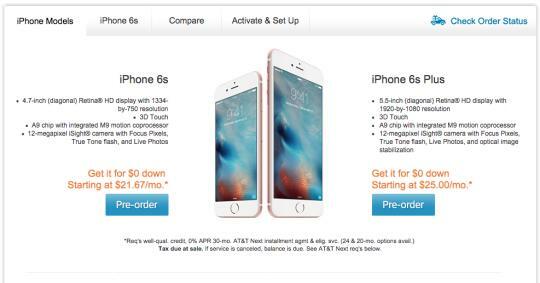 Fortunately, those options also mean that almost anybody who wants a new iPhone can get one for a reasonable price.